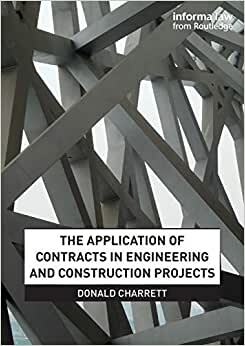 Start reading The Application of Contracts in Engineering and Construct... on your Kindle in under a minute. 5.0 out of 5 starsKey resource for construction professionals and lawyers alike! This is a comprehensive collection that could easily be handed to a junior construction professional to give them context to their role on a project – the early chapters cover the elementary nature of an engineer and how that role intersects with the construction contract itself. That being said, the level of engagement with some of the more nuanced aspects of project management make this text equally appropriate for a more advanced professional. While not intended as a text for lawyers per se, I think the context that this collection gives for the role that all manner of professionals play on a project would be beneficial for lawyers to appreciate, particularly those without an engineering background.